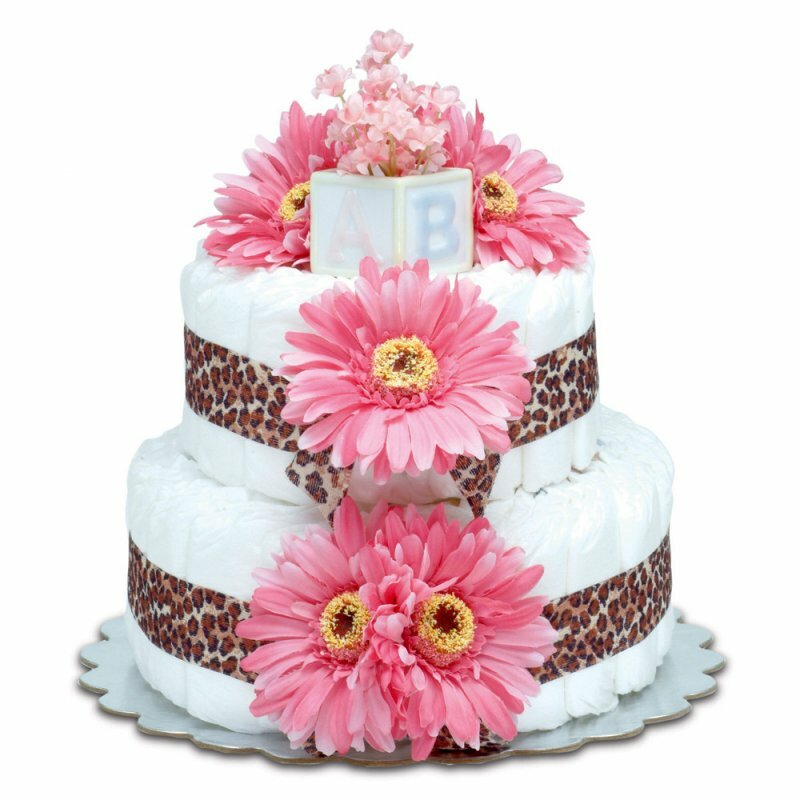 Diaper Cakes for Baby Showers | Unique Baby Shower Gifts Never Looked So Good! Unique Baby Shower Gifts Never Looked So Good! These adorable diaper cakes for baby showers are designed for the Trendy Mom-To-Be, packed full with a generous supply of diapers and doubles as a centerpiece for your baby shower table decorations. These popular unique baby shower diaper gifts are made of 40 size 1 baby diapers. 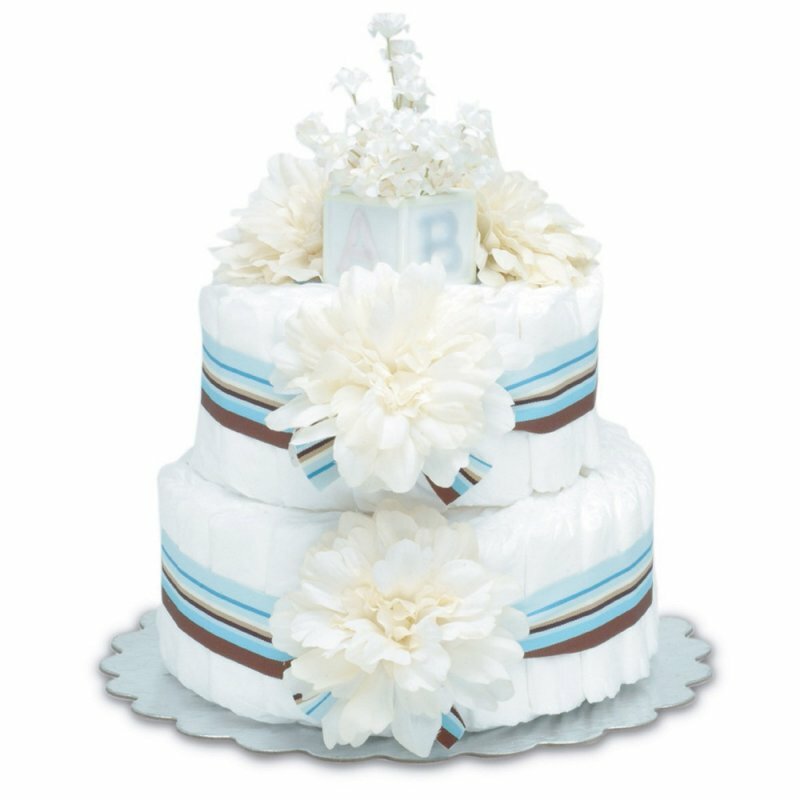 Each double-decker diaper cake is tied and secured with a coordinating ribbon and artfully accented with a stunning flower decoration. The diaper cake arrives to you gift-wrapped, set up on a cake display board and professionally wrapped in white tulle. Tulle is held closed with a beautiful satin ribbon tie and an old-fashioned safety pin. Each diaper cake arrives fully assembled. Discover more diaper cakes for baby showers in all of your favorite styles! Coordinate with these great baby shower favors that complement all diaper cakes for baby showers. Use them as decorations and have your guest take one as they leave. Individual Towel Cakes, Diaper Pin Labels For Favors and Candy Tin Favors With Diaper Pin Labels. Looking For Favors That Are A Little More Elegant? This favor display, literally "Takes The Cake!" Add a touch of class and really impress your baby shower guests. This Is Not A Diaper Cake ... 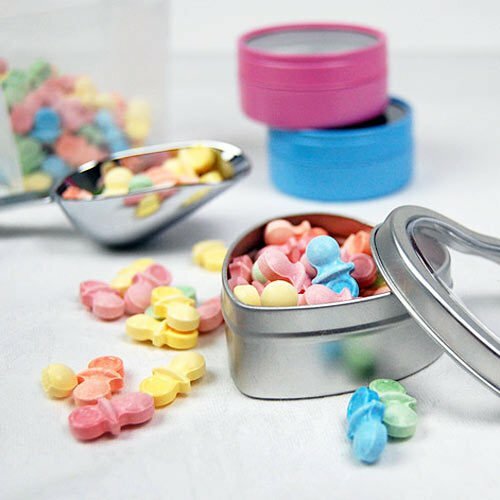 It's a Favor Cake made up of 'slices' of small favor boxes that you can fill with your favorite goodies. 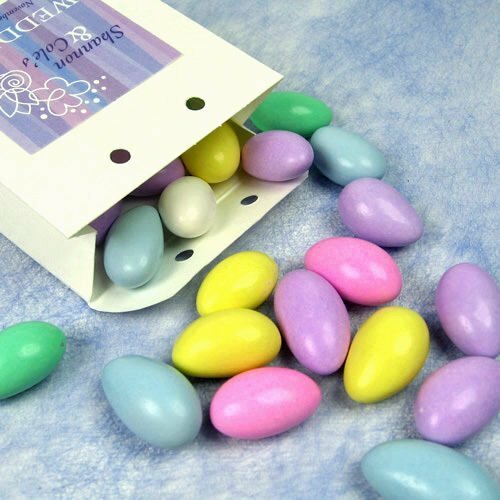 Fill each 'cake' slice with a sweet treat of pastel sweet tart pacifier candy, or some pastel Jordan almonds. Give guests something to really coo about! These baby shower favor cakes are simply adorable. Each baby shower cake is made up of baby shower favor boxes shaped like cake slices. They're not just great favors, but great baby shower table decorations as well. Each baby cake kit comes in your choice of blue, pink or yellow in one or two tiers. The ribbon on blue cakes say "It's a Boy", pink cakes say "It's a Girl", and yellow cakes say "Welcome Baby". Each tier is made up of favor boxes with handles topped with matching bows and wrapped together in coordinating baby-themed ribbon. Select from a single tier cake, up to a three tier cake. Assembly is required with these, but the kit come with detailed instructions. Cake stand not included. 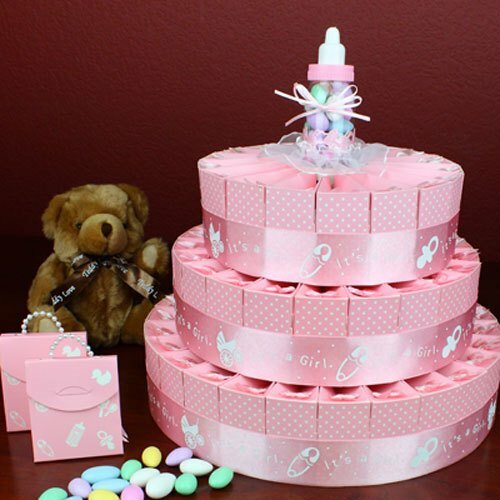 Read more details on the Baby Shower Favor Cake Kits product page.